This article may contain outdated information that is inaccurate for the current version of the game. It was last updated for 1.21. An example of states and territories as held by Castile on the Iberian peninsula. The state interface. This is a tab on the province window for each (non-colony) province in the state. 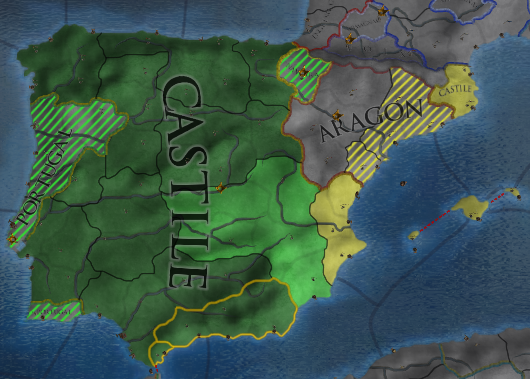 States and Territories are a mechanic introduced in patch 1.16 intended to replace the old Overseas mechanic. As such, all previous rules regarding overseas provinces, notably minimum autonomy, now apply to territorial provinces. States and territories are based on areas (part of the revamped regions system) and a two-part coring process. A newly conquered province is considered as part of a territory (unless it already belongs to one of the nation's existing states). Turning a territory into a state requires firstly coring all the uncored owned provinces in that territory and secondly payment of state maintenance. Afterwards, it is possible to instantaneously complete the coring process by paying the remaining coring costs. This section may contain outdated information that is inaccurate for the current version of the game. The last version it was verified as up to date for was 1.21. Uncored provinces (except colonies) cause overextension regardless of whether they are in a territory or a state. Coring provinces in a territory have reduced coring costs due to the Is territory modifier which applies -50% Core-creation cost (coring duration is not affected). The newly cored provinces gain territorial cores and remove the overextension penalty caused by the province. Provinces in territories have a 75% local autonomy floor. 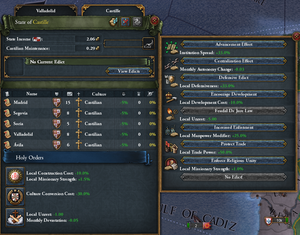 Once all the owned provinces in an area have territorial cores, it is possible to turn the territory into a state (from the province interface, above the buildings section). Have a 50% Local autonomy floor. Can't be assigned to estates, but do count towards total state development for estates that demand control of some percentage. Lose their territorial core if they are conquered and would have to be re-cored once the province is re-gained. To fully core state provinces requires paying the remaining 50% coring costs. This second coring phase is instantaneous and gives a 0% Local autonomy floor (LA is reduced instantaneously to the new floor only if it was not raised before (to lower unrest)). NB: Raising autonomy in a province not-yet fully cored will set the new autonomy floor to 100% and will annul the older "virtual" floor, not being reduced instantly after the full core anymore. Fully cored state provinces contribute fully to the nation and retain their cores even if conquered. Provinces of diplomatically annexed vassals or integrated personal union partners always get full cores. The provinces will still need to be made into states if they aren't already, but there is no admin power cost for doing so. A country can have a limited number of states, the maximum being based on administrative technology. Having more territories than the max number of states gives * +0.02% per territory over max number of states (capped at +0.8%). Notes: Do note that  revoking the status of a state (back to a territory) will not refund the administrative points used for the province coring (the cores will turn into territorial cores) and they'll be lost. Re-establishing the same territory into a state again requires fully coring the provinces anew;  assigning states in trade company regions prevents formation of trade companies (existing ones will be removed);  assigning states in colonial regions will not prevent colonial nations from forming in those provinces. A state requires monthly monetary upkeep in the form of State maintenance. When Dharma DLC is enabled, the bonus number of states is the sum of all tiers of reforms that contribute. In legacy mode, it simply depends on the government type. Completing the "Enforce a Commonwealth" mission in the Lithuania mission tree grants a "Integrated Polish Nobility" modifier that provides 3 additional states until the end of the game. Completing the "Conquer Bengal" mission in the Taungu mission tree grants a "Burmese Expansionism" modifier that provides 3 additional states until the end of the game. In each state, up to one edict can be enacted. While an edict is in place, a bonus applies to all owned and cored provinces in the state, at the cost of +200% state maintenance, a penalty that is applied before any further modifier to state maintenance. Once enacted, an edict cannot be changed or removed for one year. Edicts do apply in provinces with only territorial cores. Except for the Age of Revolutions, each age has an edict that must be unlocked with a Splendor ability. Available only in the Age of Exploration with the "Feudal De Jure Law" Splendor ability. Available only in the Age of Reformation with the "Religion Enforced" Splendor ability. Available only in the Age of Absolutism with the "Edict of Absolutism" Splendor ability. Each such state has a chance of increasing its progress towards being prosperous by +1% each month, until progress reaches 100%. The chance is 5% for each ruler skill point; for example, a ruler with 3 / 3 / 3 gives provinces a 45% chance of progressing. If any province in a state has devastation, it instead decays by −2 per month. Other things being equal, it is usually best to turn the highest-development territories into states. The States and Territories tab in the ledger lists all owned areas, their status as a territory or state, and their development. Sorting by total development will show good candidates for statehood. Areas with valuable trade goods(especially gold) are also valuable to statify because a manufactory in a high value trade good province will be worth more than in a low value trade good province. High tax provinces are also more valuable to statify in the early game, and can help in fielding a larger quantity of mercenaries, allowing the manpower development in states to be mostly ignored. Even if you're not planning on making an area into a permanent state, consider turning areas into temporary states but not fully coring them. This gives a free reduction in the autonomy floor without spending any resources. The state may be turned back into a territory when you want to make more valuable land into a state instead. It also allows using state edicts, such as the bonus to missionary strength. The only downside is any province in the state you temporarily statify will lose the full core there when you destatify it if you had a full core there from integrating a subject, and if you increased autonomy in the provinces then the bonus from increasing autonomy will be lost. Only provinces in states are counted when determining the majority culture. In order to switch primary cultures, you can un-stateify provinces of your old culture and stateify ones of the culture you want to switch to. By switching cultures, one can form any nation as long as they hold the required provinces as cores and they nation they start as isn't an end game tag. This can be advantageous especially in forming a nation to move your capital into Europe to create trade companies in Africa and Asia. A notable example is if you start as the Mamluks, conquer some Turkish culture lands, destate your Egyptian and Syrian culture provinces and state the newly conquered Turkish land, you can switch your primary culture to Turkish, allowing you to form Rûm for their powerful ideas and Ottoman Government form. This also comes with the added benefit of moving your capital into Europe which lets you use your close proximity to India and ease of controlling the Gulf of Aden to make a lot of ducats from trade from India. This page was last edited on 16 April 2019, at 16:17.